Belmont Wetlands State Park has a rich and diverse natural environment. Although areas have been degraded in the past, through sand mining and open access, the work of volunteers, the Belmont Wetlands State Park Land Manager Board (LMB) and natural regeneration has helped to bring much of the area back to a healthy natural state. Work is still continuing on weeds, dune erosion, historical mining areas and managing vehicle access to further improve the site. With 4.5 kilometers of beach front, BWSP works closely with other coastal land managers including Lake Macquarie City Council to implement best practice sand dune management. This involves balancing access for recreation with regeneration and maintenance of dune areas to prevent erosion. While sand dunes move with tides and winds, human activities have greatly changed the ability of dune systems to regenerate. Vehicle access management with the implementation of permit system. Replanting coastal vegetation to help stabilise dunes and rehabilitate mined areas. Removing weeds such as bitou bush. The wetlands are critical environmental features as they filter storm water and slow its flow prior to entering the sea and Lake Macquarie. Many of the wetlands are also listed under national and international treaties, recognising their role as habitat for migratory birds. Coastal Sand Scrub (approx. 132 Hectares). Coastal Sand Scrub is the largest community in BWSP and found where sand mining previously occurred. These can be described as areas with low plant species diversity with the main canopy plant being Coastal tea tree (Leptospermum laevigatum) alongside Coastal Banksia (Banksia integrifolia subsp. Integrifolia), Mangrove Boobialla (Myoporum boninense subsp. Austral) and Coastal Wattle (Acacia sophorae) amongst others. Swamp Mahogany – Paperbark Forest (90 Hectares). Swamp Mahogany - Paperbark Swamp Forest can be found north of Belmont Lagoon on both sides of the Fernleigh Track. Species common to this vegetation community include Broad-leaved Paperbark (Melaleuca quinquenervia), Swamp Mahogany (Eucalyptus robusta) and Swamp She-oak (Casuarina glauca). Illegal dumping can cause significant negative environmental and social impacts. Not only does dumping affect the visual appeal of the park and the local bushland, it can degrade land, encourage erosion, damage animal habitats and encourage illegal dumping by other people. Most importantly the illegal dumping of hazardous wastes and building materials particularly asbestos is a health risk to persons visiting the park for recreational activities. 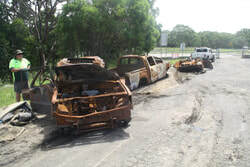 Dumping and arson of car bodies also pose a fire risk, exposing the public and emergency services to danger as car bodies can block escape access to the public and hinder access of fire fighters and emergency vehicles. Illegal dumping is a crime, if you see an act of illegal dumping we encourage you to report the incident to the EPA Environment Line on 131 555, Crime Stoppers on 1800 333 000 or NSW Police. Pest animals are also a threat to native wildlife in BWSP with introduced species such as mice, rats, foxes and cats known to be in the area. Native fauna are vulnerable to direct attacks by uncontrolled domestic pets and face the threat of being out-competed by feral animals for food and habitat. Feral cats and foxes pose a significant threat to the survival of many native species including small mammals, birds and reptiles. Rabbits directly compete with native wildlife for habitat. Additionally they impact on native plants by browsing on seedlings which prevents regeneration and loss of vegetation cover, which in turn can result soil erosion. Responsible 4WD driving along designated entry track and beach front is allowed by drivers with a BWSP 4WD permit. However driving in undesignated areas and over native vegetation has become an environmental issue. Many areas in the hind dunes are areas which volunteers have been working to rehabilitate. 4WD driving can cause erosion, smother seeds and spores vital for habitat regeneration and kills vegetation. This also affects the wildlife in BWSP as many bird and reptile species use dune vegetation as habitat.